Come to the great community of Island Estates. This 15th floor condo in the Starboard Towers building has the view you have been looking for in a home. 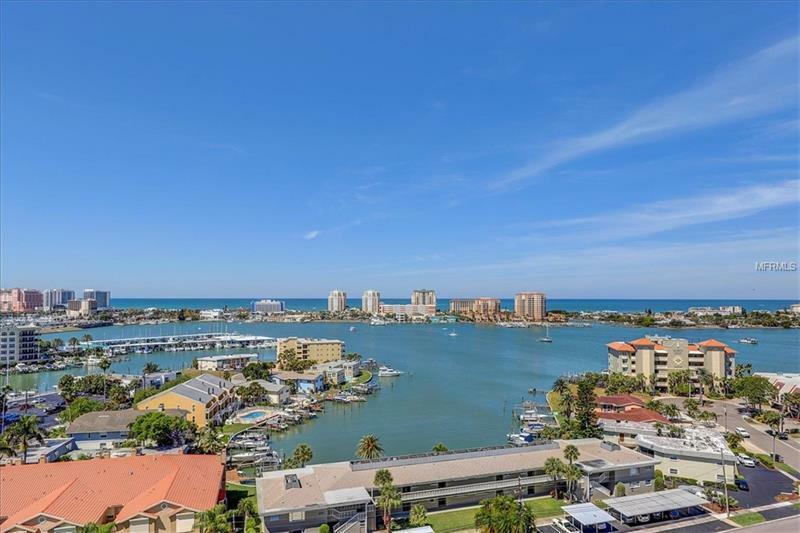 Your views of the Intracoastal and the Gulf are stunning with nothing obstructing your view. Unbelievable sunsets and great beach breezes from this 2 bedroom and 2 bath home. This home has BRAND NEW SLIDERS AND WINDOWS, new laminate and is freshly painted. New AC motor 2017, Newer appliances and water heater 2016. This spacious condo has such versatility with an open concept living room and dining room. There is an eat in space in the kitchen with lots of cabinets and counter space. Even the kitchen has a great water view. This wonderfully managed building is updating carpet in the halls, new unit doors and hardware and a fresh coat of paint will top-off the projects. This building is one block from the shopping at Island Estates. Grocery store and lots of restaurants and shopping. You are only 5 minutes to the beach and all the restaurants that Clearwater Beach has to offer. Great local transportation by the Jolly Trolly and lots of outdoor activities. You can also stay home and enjoy your resort style pool and visit with your neighbors. This building has it all and more. Don't miss out on this great condo.